Faeries don't need huge houses, of course, being such tiny creatures. And faeries just love rustic, out-of-the-way places where no one would think to look for them, like this shelf I'm turning into a faery home for Princess of the Universe. There is SO much more I've yet to add, but wanted you to see the first layers. A tree to hide under. Pink tissue paper Mod-Podged in for the base. A bird on each level. I'll post updates as I can. Princes of the Universe has not even seen this project yet. Shhh. It's a surprise. 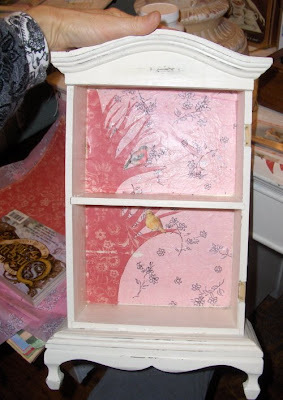 I think this would be a great little shelf for her art desk -- to keep her inspired.